The paper was submitted when Davies was a postdoctoral research fellow in philosophy at the University of Oxford. He is now a lecturer in the Department of Philosophy at the University of Birmingham. The paper is available on his website. This entry was posted in Uncategorized on March 15, 2017 by Christian Perring. AAPP finally decided to join the 21st century. This entry was posted in Uncategorized on June 1, 2016 by Serife Tekin. 8: 40 RDoC: Out of the fire and into the frying pan? 9:10 Handwaving at validity – Can we measure psychological constructs? 3:15 The normal, the pathological, and RDoC: what about race and gender? 9:30 Should psychiatric nosology be constrained by underlying causal mechanisms? 3:40 What is a diagnostic error in psychiatry? This entry was posted in Uncategorized on March 14, 2016 by Serife Tekin. Psychiatry raises a number of important philosophical questions, spanning ethics, epistemology, and metaphysics. Moreover, philosophical attention to these issues has the potential to influence clinical practice and health policy, which in turn affects public understanding of mental disorders and the lives of patients. This book aims to be an accessible introduction to philosophy of psychiatry for undergraduate philosophy majors, medical students, and residents in psychiatry, but also to be of interest to professionals new to philosophy of psychiatry. The contributions to the volume should draw explicit connections between themes in philosophy of psychiatry and the traditional areas in philosophy, particularly philosophy of mind, philosophy of science, ethics, social and political philosophy, and metaphysics. Sections on each of these broad areas will consist of several chapters that offer distinct, but complementary, approaches to the topic. More specifically, we are especially interested in work that examines emotions/affectivity, narrative and first-person experiences, politics and patient perspectives (including the recovery movement), agency/autonomy, hermeneutic approaches to understanding mental disorders, issues in neuroethics, explanation in psychiatry, though we will also consider proposals on other topics. Each chapter will be around 6000 – 7000 words, including bibliography, and the deadline for chapter drafts will be December 31, 2016. An abstract of approximately 250 words to both Robyn Bluhm, rbluhm@msu.edu and Şerife Tekin, stekin@daemen.edu by March 18, 2016. You are also welcome to contact the editors with any questions. This entry was posted in Uncategorized on February 23, 2016 by Serife Tekin. Below, I share with you Kathryn Tabb, Phoebe Friesen, and I’s new work during our session. Before I do so, I want to highlight that there has been quite a few interesting philosophy of psychiatry presentations at the ISHPSSB, including Steeves Demazeux’s “The Ideal of Scientific Progress and the DSM”, and Serife Tekin’s “Self in Scientific Psychiatry.” I was delighted to see that we are a growing presence in the ISHPSSB community! In this session we examine some contemporary debates emerging in the philosophy of psychiatry, at the intersection of ethics, metaphysics, and philosophy of science, as philosophers, researchers, and practitioners begin to come to grips with psychiatry’s dual nature as a science and an evaluative system. In particular we ask, what is the appropriate ontological framework and methodology for psychiatric research? What kinds of things can psychiatry study and intervene upon? And, what kind of normative standards are the right ones to use in determining what counts as mental illness? A significant portion of the scholarship in analytic philosophy of psychiatry has been devoted to the problem of whether or not psychiatric disorders are natural kinds, and if they are not, what kind of thing they are. My contention is that this problem is fast growing less relevant to the concerns of practitioners and service-users of psychiatric medicine. Dissatisfaction with what I call the “diagnostic kind model” of psychiatric objects is currently appearing on a variety of fronts. Among clinicians of diverse orientations, it manifests as a dislike of, and in some cases open rebellion against, the hegemonic authority of the American Psychiatric Association (APA)’s Diagnostic and Statistical Manual of Mental Disorders (DSM). Among clinically-oriented researchers, it presents as a frustration with the demarcation of nosological boundaries that has so long occupied psychiatry as a science. Among scientifically oriented researchers, it is most obvious in the introduction by the National Institute of Mental Health (NIMH) of an alternative tool for classifying psychiatric research, the Research Domain Criteria project. I argue that by focusing on the problem of kindhood, philosophers have neglected the development of a conceptual account that could explain the sort of scientific progress that the NIMH is envisioning, which could also accommodate the sorts of challenges raised by practitioners about the insufficiency of the DSM to describe their patients or promote their best care. I take as my examples the employment of Richard Boyd’s homeostatic property cluster (HPC) kind account by various philosophers, and the “exemplar” account promoted by Dominic Murphy. I demonstrate that these accounts still rely on what I call the “received authority” of diagnostic kinds, the very assumption that the NIMH and others are criticizing. This project seeks to examine the way in which an overriding focus on the medical model in psychiatric investigations today stands in the way of the dual goals of psychiatric research, to heal and to explain. Like any model of the mind, the medical model contains assumptions regarding ontological priority, by attributing a certain kind of causal reality to a particular level (neurological), at the expense of others (cultural, psychological, genetic). During scientific investigation, attributions of ontological priority constrain what hypotheses will be tested, what is seen as relevant data, how that data is interpreted, and eventually what explanations and treatments will be developed. This suggests that today’s emphasis on the medical model may be leading us to miss out on potential explanations and treatments that could be developed in response to mental disorders. While an abundance of important work is being done focusing on the role of the brain in psychiatric illnesses and developing pharmacological treatments as a result, there are a number of levels or perspectives that are given far less attention, particularly those regarding an individual’s cultural and phenomenological experiences. For this reason, I argue that psychiatry would do well to adopt a stance of ontological pluralism, which encourages an exploratory and open-ended approach to ontology within research. Such an approach aims to lessen the impact of restrictive ontological frameworks on our potential for discovering relevant explanations and effective treatments that might not otherwise come into view. While ideally a science consilient with the other sciences of the mind/brain, psychiatry also involves normative and evaluative concepts, as one goal of psychiatric practice is to alleviate the suffering caused by mental illness. But what kinds of evaluative standards are the right ones to use in determining what counts as mental illness? Because diagnosing an individual as having a mental disorder can be a way of saying that they have a condition that is bad and ought to be corrected, or that their pattern of behavior is somehow deviant or harmful, the evaluative nature of psychiatric diagnosis has historically been used as a tool of social control (Banaji, 2013; Satcher, 2001). In this paper I argue that, in order to ensure that the concept of mental health will be a useful one for theorizing about human flourishing, it should pick out a real psychological phenomenon in human lives, which has significance to the individuals the theory is about. In short it must have normative authority, “the feature in virtue of which people have a reason to follow the imperatives of a normative theory” (Tiberius & Plakias, 2010). To this end, everyone to whom the theory is supposed to apply should have some motivation to care about what psychiatry recommends, and there should be standards of justification for these recommendations. I examine one contemporary attempt to articulate a normative theory for psychiatry—George Graham’s (2010) Rationality-in-Intentionality (RIT) thesis—and argue that it lacks normative authority. The specific norms RIT proposes come apart from what may actually be better for the individual in this case. Finally I argue that in order to solve the problem of paternalism, psychiatry must ground what it means to be mentally ill or mentally healthy in the concerns of individuals. Looking forward to seeing you all again soon! This entry was posted in Uncategorized on July 14, 2015 by Serife Tekin. The science of psychiatry advances by means of empirical research. Scientific cultures, however, rely upon on non-empirical commitments such as methodological preferences, criteria for good constructs, and decisions about how to allocate limited resources to a superfluity of scientific goals. For instance shortly before the publication of the DSM-5 ̧the National Institute of Mental Health announced the goal of ultimately replacing the DSM as a guide for scientific research in psychiatry. Their preferred alternative is called the Research Domain Criteria (RDoC), a classification matrix of basic psychological capacities that lend themselves for explanation by relevant biological mechanisms. In some respects RDoC is as much a philosophical revolution as a scientific one. Accompanying this transition is the burgeoning body of first person accounts of patients, narrating the experience of mental disorder and psychiatric treatment, adding to the sources of knowledge in psychiatry. Both these transitions in the psychiatric landscape create further impetus to revisit important topics pertaining to scientific research in psychopathology, not only among psychiatrists and psychologists, but also among philosophers and historians of science who specialize in thinking about the nature of scientific research and progress. What are the advantages and disadvantages of the RDoC framework for psychiatric research ? How could recent philosophical work on mechanisms contribute to RDoC’s promise to develop a causal understanding of psychopathology? Should latent variables be considered causes of behavior? To what does construct validity refer in a psychiatric context? Categories of mental disorder may not carve nature at the joints. Do competing dimensional models? Can research in the history and theory of psychopathology contribute to the progress of scientific psychiatry? How can the work on values in feminist philosophy of science address the various tensions that exist between scientist versus practitioner perspectives? What are the implications of the differences between folk psychological and scientific psychological concepts on scientific research on mental disorders? Can patients’ experiences with mental illness contribute to scientific progress, or are they incommensurable? Presentations will be strictly limited to 20 minutes, followed by 10 minutes for discussion. Abstracts will be blind reviewed, so the author’s identifying information should be attached separately. Abstracts should be 500-600 words and sent via email by November 15, 2015 to Şerife Tekin (stekin@daemen.edu) and Peter Zachar (pzachar@aum.edu). Notices of acceptance or rejection will be distributed in January. This entry was posted in Uncategorized on July 9, 2015 by Serife Tekin. Conferences can be overly stressful for early career members of the profession. Besides the dreadful experiences of talking in front of an audience and the struggle of surviving the Q&A session without too much damage, we often feel the pressure of “networking” and “getting our ideas known” to other people in our field. Unfortunately, many conferences are also quite useless in this respect: formal opportunities to interact with senior scholars are very limited, and graduate students easily end up hanging out with each other during the informal events. Last November I attended a conference that was an interesting exception to this rule. The Early Career Scholars Conference in Philosophy of Psychiatry at the Center for Philosophy of Science (Pittsburgh) was organized by Şerife Tekin (Daemen College) and Kathryn Tabb (University of Pittsburgh) with two main goals in mind. The first was to tackle a current issue within psychiatry – i.e. overcoming mind-brain dualism – to sparkle the interest of philosophers and psychiatrists alike, thereby promoting interdisciplinarity and cross-fertilization between the two disciplines. The second goal was to facilitate the interaction between early career researchers and senior members of the profession, creating opportunities to discuss each other’s ideas and works-in-progress. I must say that both goals were brilliantly achieved. As an early career philosopher of psychiatry, I found three aspects of this conference particularly impressive. First, I was surprised to see that several psychiatrists attended the event and engaged in thoughtful interactions with the speakers and poster presenters. It was interesting to see that medical practitioners were both attentive and responsive to philosophical developments concerning their discipline, since – qua philosophers – we often struggle to understand the practical implications of our research. This experience made me more confident about the possibility of building fruitful relationships with people working in psychiatry and strengthened the idea that we are interested in similar questions after all. 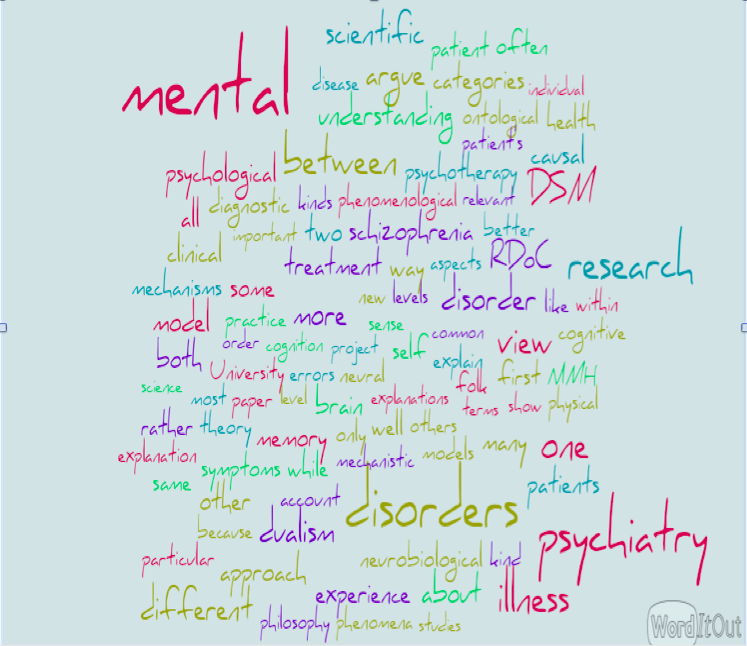 What kinds of things are psychiatric disorders? What are the causes involved in the onset of mental illness? What are the methods with which we can successfully intervene to improve the health of psychiatric patients? How can we make sense of the patients’ experience when this involves some sort of “reality distortion”? Second, the conference format facilitated a number of formal and informal interactions between early career scholars and more experienced researchers in philosophy and psychiatry. The event was set up in a way that allowed junior philosophers to present their work effectively through talks and posters, and senior scholars to provide feedback as formal commentators or simply as members of the audience. The (relatively) small number of participants contributed to create a friendly and collaborative environment, making the discussion very focused and at the same time accessible to everyone. I believe the poster session was particularly successful in this respect: over lunch break, most participants took the time to browse through the posters and discuss their content with the presenters. This is (unfortunately) still quite unusual for philosophy conferences, where posters are often relegated to the hallway or scheduled for super-inconvenient times of the day. Hanging posters in the same room where the talks took place and offering a dedicated time to them was definitely the right move to ensure that they got appropriate attention. Third, I was impressed to see how many different approaches and philosophical paradigms were represented in the contributions. Although papers and posters were carefully selected based on their accordance with the general theme – as Rob Wilson pointed out in his plenary remarks – there was a huge variety in terms of perspectives, methodologies and philosophical affiliations. Again, it is definitely not easy to find a conference where canonical issues in philosophy of science happily go hand in hand with phenomenological reflections and methodological, ethical or historical analyses. However, this is exactly what happened in Pittsburgh: the contributions dealing with reductionism (Goyer & Faucher; Lemoine), dualism (Hine; Hochstein; Kotsko; Ross) and pluralism (Friesen; Petrolini; Tabb) were seamlessly interpolated with the ones focusing on the history and social locatedness of psychiatry (Radden; Tekin) and with others discussing phenomenological (Fernandez; Jeuk), methodological (Buckwalter; Krgovic; Ozel; Repnikov; Robins; Winzeler) and ethical issues (Sadler; Washington). A few months later, what lesson can we draw from this event? More specifically, what are the desiderata for a successful early career philosophy conference? Here are my suggestions. Make sure that the work of early career scholars gets the right attention. This means creating various opportunities – e.g. talks, poster sessions – where junior philosophers have the chance to present their work and discuss their ideas thoroughly with the audience. Create formal opportunities for interaction between early career philosophers and senior members of the profession. This can happen in a variety of ways: assigning commentators to individual papers worked well in this case, but other formats are worth exploring as well (e.g. mentoring workshops, career development panels). If you decide to have a poster session, emphasize its importance by offering a dedicated time and space in the conference schedule. In particular, make the extra-effort to encourage all the participants to interact with the poster presenters and give them feedback. If the topic of the conference is interdisciplinary in nature, make sure that all the contributions are refereed both by a philosopher and an expert of the other discipline (e.g. a biologist for philosophy of biology conferences). This helps to ensure that the papers are dealing with issues that are theoretically interesting and also up-to-speed on the relevant empirical evidence. Make sure that diverse paradigms and perspectives within philosophy are represented in the contributions. This helps to go beyond traditional (and often artificial) boundaries – e.g. analytic versus continental – and to focus on common problems and innovative solutions. and here (John Norton’s comments). Valentina Petrolini is a doctoral candidate at the Department of Philosophy at the University of Cincinnati. Her work is mainly in Philosophy of Psychiatry, but her broader interests lie at the intersection between Philosophy of Mind and Epistemology. This entry was posted in Uncategorized on May 31, 2015 by Serife Tekin.